The United States Supreme Court’s decision in Bristol-Myers Squibb v. Superior Court of California, shuts down certain forms of forum shopping, but it might lead to more lawsuits being filed in New Jersey state courts because of our state’s plaintiff-friendly laws and the fact that many major businesses call New Jersey home. On October 20, 2017, the New Jersey Civil Justice Institute hosted a conference exploring this issue. The featured panel was moderated by Shalom Stone of Stone Conroy LLC. It included remarks by Sean Marotta of Hogan Lovell, John K. Kim of Johnson & Johnson, Theodore H. Frank of CEI’s Center for Class Action Fairness, and Eric Jaso of Spiro Harrison. If you would like to become a member of the New Jersey Civil Justice Institute, and attend future events in person, please contact us. A selection of the need-to-know civil justice news for the week of June 24-30. A handful of states, including New Jersey, have been thumbing their nose at the United States Supreme Court’s rulings on arbitration. Last month, the Court once again said this needs to stop. 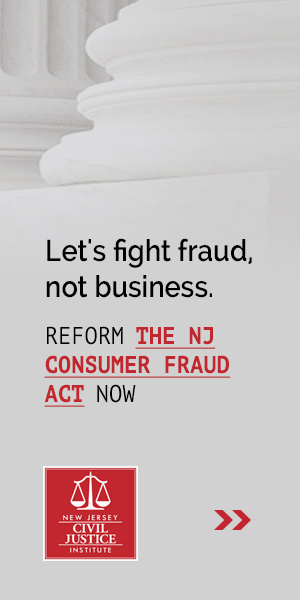 Will the New Jersey Courts listen? Or are they waiting to be called out by the High Court? Archis A. Parasharami of Mayer Brown, one of the nation’s leading experts on arbitration law, answered these questions and more during the latest NJCJI Policy Teleforum. This is an edited recording of a call that took place on May 23, 2017. If you would like to participate in future calls as they happen, and receive CLE credit for them if you are an attorney, please contact NJCJI President Marcus Rayner. What Does the Latest SCOTUS Ruling on Mass Actions Mean for New Jersey? A selection of the need-to-know civil justice news for the week of March 12-18. On Wednesday, March 16, President Obama nominated Merrick B. Garland to the United States Supreme Court seat left vacant by Justice Antonin Scalia’s death last month.